Create vibrant prints that feature rich colors with the PP-301 Photo Paper Plus Glossy II from Canon. This 265 gsm paper has a glossy surface finish and a square format, which is useful for printing images that are shared on many social media platforms. The paper comes as a 20-pack of 3.5 x 3.5" sheets that are compatible with Canon PIXMA TS9500, TS8200, and TS6200-series printers. 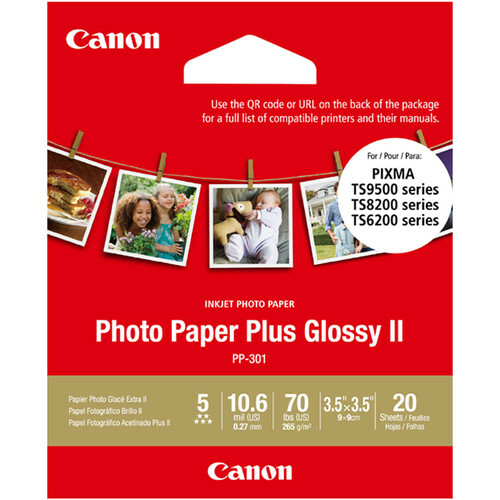 Box Dimensions (LxWxH) 5.2 x 4.11 x 0.2"
PP-301 Photo Paper Plus Glossy II (3.5 x 3.5", 20 Sheets) is rated 5.0 out of 5 by 1. Rated 5 out of 5 by Mariano from Nice product High quality photo paper at a decent price. Would definitely purchase it again.